Steve Kinniburgh believes Corby Town’s impressive start has set them up for the rest of the campaign. The Steelmen enjoyed an excellent 10-match unbeaten run to open up the Evo-Stik League South Division One Central campaign before suffering their first loss when they were beaten 2-1 at third-placed Peterborough Sports last weekend. 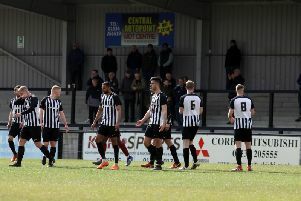 The unbeaten run, which included seven wins and three draws, saw Corby move to the summit before they surrendered top spot to Bromsgrove Sporting following last Saturday’s defeat. The Steelmen will be hoping to bounce back when they return to Steel Park to take on Thame United this weekend. And Kinniburgh has now challenged his players to try to get on another unbeaten run of form. “When you are in pre-season, you are always looking at how you can put yourselves into the best possible position,” the Corby boss said. “And, for me, getting a good start was key because that sets you up for the whole season. “We have had a great run of 10 matches unbeaten with seven wins and three draws and it really has set us up for this middle part of the season. “It’s going to be tough because the pitches will become a bit heavier as we head towards Christmas. “Our full focus is on the league. We haven’t got any cup matches to think about and we are pretty much Saturday to Saturday from now on. “That means we will have a lot of time where we can get on the training pitch and work on a few things. The Steelmen, meanwhile, will have to make at least one change to their starting line-up this weekend. Full-back Miles Smith was sent-off for retaliation in the second half of last weekend’s loss with Kinniburgh revealing the player apologised to the rest of the squad after the final whistle. He now begins a three-match ban but Kinniburgh believes his squad can cope with the loss of the right-back and he is now keen to see who will take the opportunity that has arisen. “We have the boys sitting on the bench and they have been very patient,” the Steelmen manager said. “It’s opened up for someone to come in and I have been looking at it over the past few days and, to be honest, I think I have two or three different options to change it up. “There is going to be an opportunity for someone to come in and show what they can do. “This is where having a strong bench will help. I feel I have a strong squad and we can cope with these situations when they arise. “It was obviously disappointing for Miles and he apologised for what happened.